Why do Piston Rings Need Gapping? Many performance piston manufacturers supply piston rings which are designed to be “gapped” prior to fitting into the engine. This is increasingly the case especially with piston kits of American origin for both cars and motorcycles. 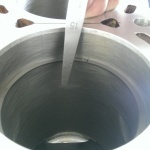 Gapping is a general term used to describe the setting of the piston ring end gaps in the cylinder bore. High performance piston manufacturers will supply data for ring gaps which will vary depending upon the use of the piston concerned. Normally aspirated engines will require less ring gap than a turbocharged one which in turn may need less than one in a racing application. 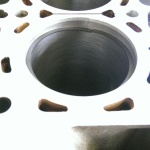 As a general rule, the higher the engine performance the larger the ring end gaps will need to be. This has to do with the heat generated inside the cylinder which in turn affects the gaps. 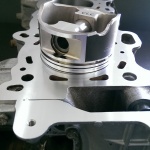 Higher performance engines produce more heat which will cause greater expansion of the piston rings which in turn need to have larger end gaps to prevent them “butting” as they expand. Butting describes the condition where the rings have expanded to the point where they have used up all the available space both in the clearance usually present in the depth of the piston ring groove and also in the end gap itself. At this point, should the ring continue to expand, it will be forced out against the cylinder wall causing excessive friction leading to a seizure of the piston at this point and subsequent engine failure as a result. As you can see, this makes correct piston ring gap an essential part of any engine rebuild and we recommend that end gaps are checked whenever piston rings are replaced. At H T Howard we can set piston ring gaps on your high performance piston kits for your specific application. While setting ring gaps isn’t particularly technically demanding it does call for great attention to detail and a lot of patience. To achieve the high degree of accuracy required, the ring can only be machined a little at a time while constantly checking to ensure that too much material is not removed resulting in an over large ring gap which might make the ring unsuitable for the application. The ring to be gapped is first placed into the relevant cylinder and an inverted piston is pushed down onto the ring to set it square in in the bore. A feeler gauge of the correct size to match the gap required is selected and the gap checked. If the gap is too small the ring ends will need to be machined. At H T Howard we use a dedicated ring grinding jig for this operation. 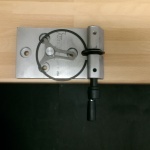 The jig can be adjusted to accommodate a range of ring sizes using a sliding fork. This locates in the inside diameter of the ring to be machined and fixes it’s position within the jig. This ensures that if the grinding operation needs to be repeated, the ring can be returned to the jig in exactly the same position as before. The jig also features a diamond wheel driven by a handle which is rotated in order to grind the ring. Due to the delicate nature of the job, the ring end is ground very slowly using only light pressure and a few turns of the hand wheel at a time. 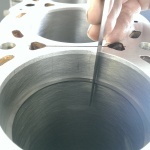 After each few rotations of the grinding wheel the ring is returned to the bore for further checking. This procedure is repeated until the correct ring gap is achieved. Once the correct gap is achieved the ring ends are de-burred to ensure that there are no sharp edges which might score the cylinder. Finally, each ring is fitted to the appropriate groove in the piston paying attention to any marking indicating correct fitment. 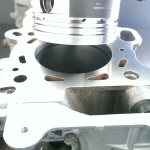 Set the piston ring in the grinding jig ready for machining. Grind the piston ring a little at a time.